Rolling up to a strangely suburban apple orchard in the early morning, Jolie Devoto’s words come to life. She welcomes us to her family’s land in Sebastopol — an orchard founded 30 years ago by Jolie’s apple-growing father Stan and flower-loving mother Susan. Devoto Orchards is one of the few remaining heirloom apple orchards in Sebastopol, and Stan Devoto has made it his mission to preserve the region’s rare varieties. “I grew up running through fields of sunflowers and chasing my friends through the apple trees,” Jolie recounts. Now, she runs the successful cider-making arm of the Devoto business she built from scratch — with access to the plentiful and rare varieties her father Stan has championed, it just made sense. That spirit of curiosity, discovery, and pure passion colors everything she says, just as excited by tasting a Monk’s Kettle cider as she is recounting studying cider-making in Spain. Jolie Devoto is obsessed with cider. And the apple doesn’t fall far from the tree — this attitude stems from a father who fell in love with apples. Stan Devoto is a legendary pioneer in restoring the apple heritage of the Coastal Northern California region, cultivating a massive variety of apples, including the native Gravenstein, which Jolie features in the Devoto label brew Save the Gravenstein. The Devotos have worked hard to restore biodiversity not just because it’s the right thing to do — supporting year-round staff and sustaining the ecosystem of the orchard — but also because of their sheer love for the fruit itself. “I know for my dad, he describes it as this type of trance that he gets in when he’s in the orchard pruning. It’s just his groove.” You don’t need to see much more than Stan Devoto’s calloused farmer’s hands to know just how involved he is with on-the-ground operations. In the orchard, Stan is in his element — plucking the ripest apples for tasting and feeding them to the dog at his heels, Willie (as much an apple enthusiast as Stan himself). As he slices up a particularly sour variety of apple, it’s clear just how Stan and Jolie complement one another out in the orchard. For Stan the fruit is too sharp to eat, but Jolie sees its potential as a component in a new, more bitter-tasting cider. She’s a true believer in the bubbly stuff. And she has access to some of the best apples on earth here to produce their estate label, Devoto and the cidery’s adjacent label Golden State. The orchard is the sole apple supplier for the Devoto label, which makes it an estate cider — the apples and the cider are both produced on-site. For Jolie, the benefit lies in the apples themselves: “The apples in Sebastopol are some of the best in the world because they get that maritime climate and the huge variation between temperatures which really helps grow acidic, full, robustly-flavored fruit.” The apples are more concentrated in flavor here because of dry-farming, which also results in a kind of earthy tinge rarely found anywhere else. So Jolie not only knows exactly where her apples are coming from (maybe even which trees), but also gets that singular flavor distinct to the region in each cider. The Devoto label really has been a unique opportunity for Jolie to experiment with coastal California apple varieties (she counts 55 of them on the orchard).“When I tasted the first ciders that I made, one of which was 100% Arkansas Black and the other a bone dry kind of farmhouse-y type cider, they were delightful.” She opened a few bottles for us on our visit, one from the very first batch she ever made at Devoto, to taste how far she’s come. Jolie was as generous with cider as Stan was with apples, and Willie with licks. But, there are only so many apples she can pull from the Devoto orchard, and the cider produced is more expensive. 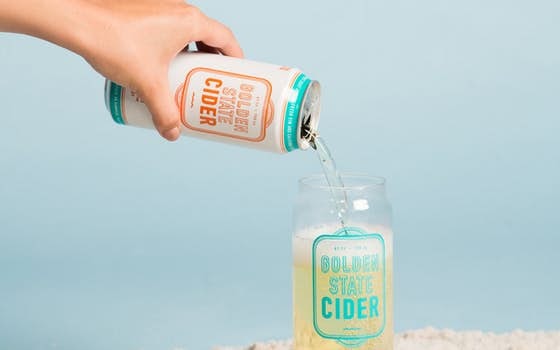 To make more cider for more people, she created the Golden State Cider label in 2012, which she runs in tandem with Devoto. The apples for Golden State are sourced from partners in Washington, Oregon, and California with the same sustainable, quality-obsessed sourcing ethos as Devoto. Walking through the Golden State brewing and canning facility, just a short drive from the orchard, Jolie stops for a friendly chat with every worker we see. She knows everyone by name, same as Stan — a reflection of their family-first and community-led brand. Where the Devoto label is focused on experimentation with different apple varieties, Golden State is where Jolie plays around with hops, herbs, and spices. From the classic not-too-sweet Mighty Dry to the astonishingly vibrant, almost kombucha-like Gingergrass, you’ve never tasted ciders like this before. Jolie says their number one focus is “making sure the apple shines.” Even in a drink like Mighty Hops, which is dry-hopped, the addition of Northwest Pacific hops complements rather than overpowers the fruit — it’s like biting into a fresh Granny Smith. The future looks bright for Jolie Devoto. She told me that she’s in the process of merging the Devoto and Golden State labels, which would allow them to can cider made purely from Devoto apples in what they’re calling the Harvest Series. A brand new apple press will give her greater creative control over flavor and the possibility for small batch brews. Jolie Devoto has a plan for Golden State: “I have this vision of being the craft cider of California.” She, like her father, straddles the line between tradition and innovation — staying true to sourcing standards, attention to quality, and unmitigated respect for the fruit and the cider, all the while pushing boundaries to discover uncharted flavors and brewing techniques. And with a product that reflects dedication to quality and an eye for originality, I wouldn’t be surprised if her vision becomes a reality. Shop Devoto’s incredible heirloom apples and refreshing ciders on Good Eggs. Staff Writer at Good Eggs. Big mouth, bigger heart, biggest stomach.